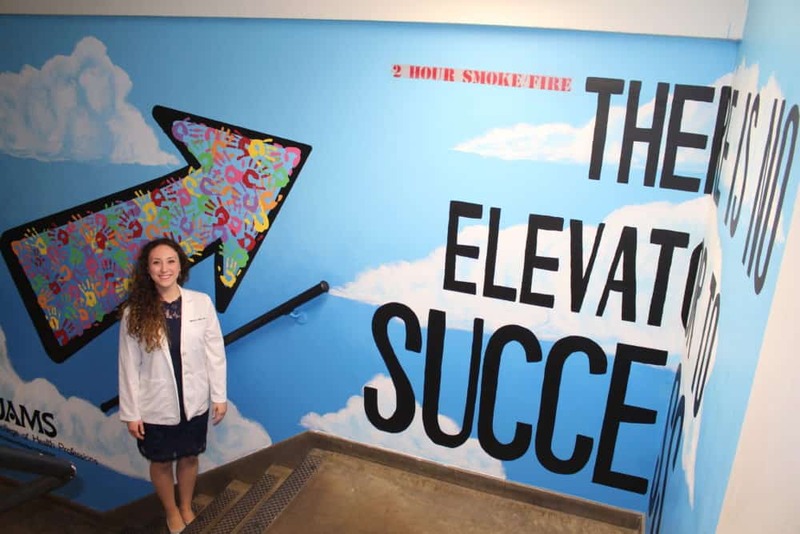 Marissa Miller, a student in the Physician Assistant Studies program, stands beside her mural. 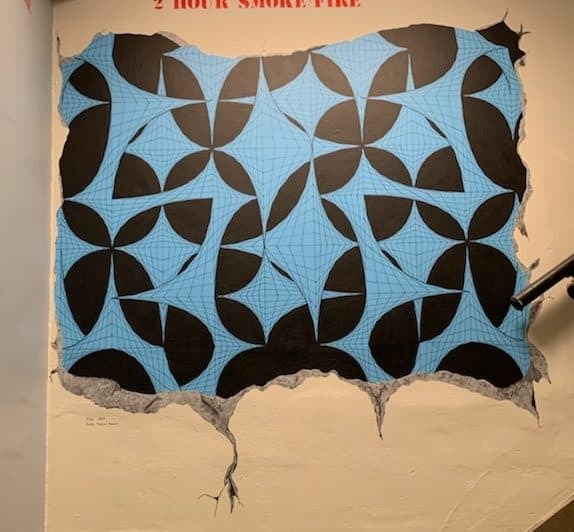 March 25, 2019 | One of the stairwells on campus has gotten an inspiring facelift. 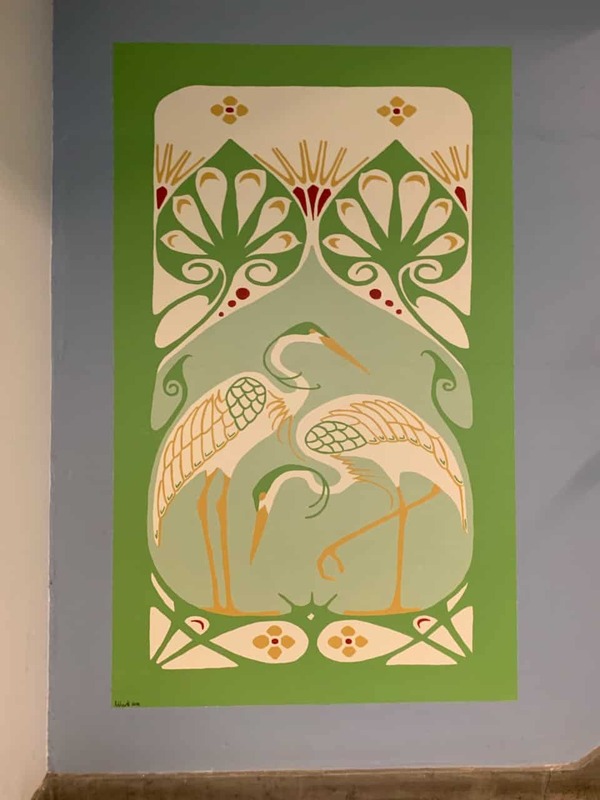 The Get Healthy UAMS committee chose three artists to paint murals in the Central Building’s Stairwell Five, located behind the C elevators. The murals are located between the ground floor and the first floor. 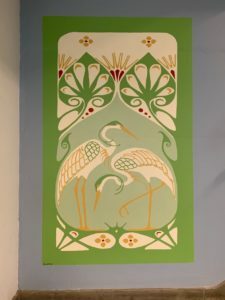 Merideth Addicott, an assistant professor in the Psychiatric Research Institute, recreated a green art nouveau-style mural of two herons by A. Smit. Two UAMS employees and one student were the artists chosen to help with the project. Each had a unique vision that the Get Healthy UAMS committee thought would make an impact, said Cannady. The artists donated their time to create the murals. The murals turned out beautifully, said Cannady. The stairwell isn’t the only place on campus where one can see Addicott’s work. She also has painted a couple of murals for PRI. For Fitzgerald, the mural gave him a chance to share his art with a new audience and meant that he didn’t have to worry about storing the finished piece. Marissa Miller, who is in her first year in the College of Health Professions’ Physician Assistant Studies program, was the lone student artist to participate. She painted a blue sky, complete with fluffy white clouds, and an arrow, which has been filled in with her classmates’ handprints, that pointed up. A motivational saying, “There is no elevator to success,” completed the mural. “I designed this mural so that as you climb the stairs, you look up toward the sky,” she said. Cannady said the committee was pleased with the artwork and hopes to do this again.